On Sundays friends Reg Mead and Richard Miles would take to the fields of Grouville, in the Bailiwick of Jersey, an island in the United Kingdom, to search for an ancient Celtic Hoard. The hoard had become the stuff of legend, only coming to the men by way of folktale or dream. For three decades their search turned up nothing. These men, however, did not waiver in their commitment. "There was something there that drew us to it,” said Miles. That “something,” whether intuition or a feeling more akin to premonition, would eventually lead them to the Catillon II hoard. With the help of experts from the Societe Jersiais, Jersey Heritage, and Guernsey Museum, the mound of dirt that encased the coins was carefully excavated. In the lab, scientists with Jersey Heritage meticulously removed each individual coin from the large clump of dirt that had become as solid as rock. 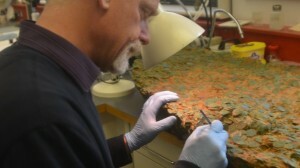 They discovered that the coins date back to first half of the 1st century BCE. It is speculated that the Coriosolitae tribe of the French Celts buried the coins while escaping the imperial forces of the ancient Romans. Hiding away with the coins were glass beads, a leather purse, a woven bag full of silver and gold, and gold neck torques, among other jewelry. The slow extrication of the coins from the rocky mass mirrors the labored excavation of the hoard from the ground. Yes, Miles and Mead managed to retrieve 20 coins by the end of the first day, but the earth would not so readily yield its prize. "We were literally scooping out the earth it was so deep," said Miles. As days passed, exhaustion mounted. Miles recalls being urged by Mead to ignore fatigue, forge ahead. “Give it one final try,” said Mead. So, tapping into what little energy he had left, Miles jammed his spade into the ground as if to pry apart the earth, to mimic tectonic shift. The event did not register on Richter scales, but it did shake the world of numismatics. 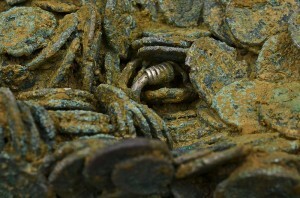 That is because the hoard that had eluded the men for thirty years was comprised of 70,000 ancient coins! Six times larger than any Celtic hoard found before, Catillon II hit news wires around the globe. Its estimated value is £10 million, more than $12 million. Government officials with the Bailiwick of Jersey will soon vote on whether or not it will pay to keep the hoard on the island.